Wizard slots are for you who love all things magical. Witchcraft has been around since the days of the world-famous witches of Salem, to the era of flying witches. And today, when witches dress and live like normal people. Witccraft has also been the inspiration to many grim films and books. The plots are usually spine-chilling, with a twist to it. Now you can wave your wand for free spins, bonuses and jackpots. Find your magic at the best online casinos and prepare to be spellbound! If you are into not one but several jackpots, this 6-reel slot is the best for you. Yggdrasil’s Ozwin is an action-packed slot, set against a fantastical background. All graphics in this game are magical. Follow the famous wizard Ozwin as he tries to free the powerful image from his transfigured form. The best part is that the jackpots are regular and the RTP is 96.7%. So, all you do is win. Unlock the Free Spins feature whenever you discover five orbs, trigger one of the jackpots and gather five feathers. Of course, this is a pig pun on one of the most famous kid wizards of the past two decades. Here we have an amusing pink fellow who can wield a wand. He is in a purple, pointy hat, a sharp-collared wizard robe and frog glasses. The pig might not be a relative of Delboy but he can offer a Magic Mirror, Squeal Rounds and a Board Game. You will also like his wide and welcoming smile. Play this 50-pay line slot for a chance to win 7500x your stake. The design of Wizard Shop is well-advanced to fit the modern player. However, the items in the shop are the classics like; the Sands of Time Glass, potions, magical coins and scrolls. The game is set against a brown and blue background. Then there is an owl, a weird eye sign at the back and dim lighting. This game comes first two features: Scatter Wilds and Bonus Coin. For a bonus, silver and gold coins on the trees are added to the bonus bank. You can then use the coins to shop until you trigger three scroll symbols. You can always buy wilds, scatters and multipliers in the bonus round. 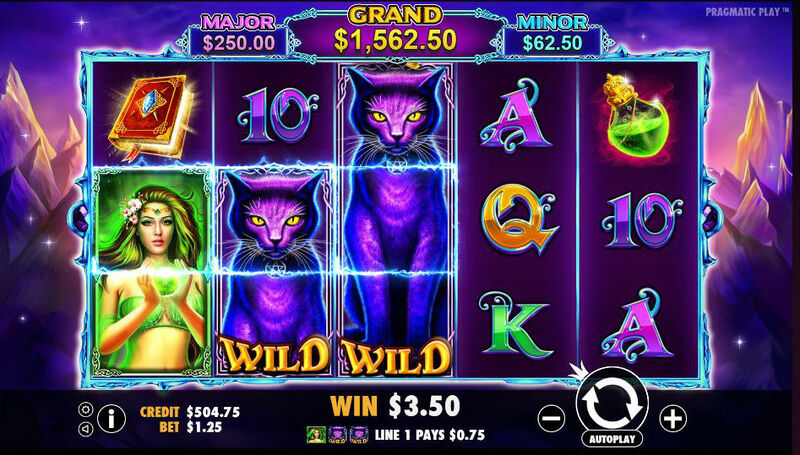 This 5-reel slot comes with exotic sorceresses who wish to cast a spell on you. Pragmatic’s Wild Spells has a huge, black Cat as the Wild Symbol. Pick your bonus in the large Free Spins section. You can also forgo your Free Spins for a chance to select a combination of extra wilds.